Guitarist Matthew Stevens has already made a name for himself through his work with artists like trumpeter Christian Scott, saxophonist Walter Smith III, drummer Terri Lyne Carrington, and bassist-vocalist Esperanza Spalding. But he shouldn't be pigeonholed as a support player or viewed simply as sideman du jour in the eyes of the jazz world. That would be a mistake, as he has plenty to offer on his own. 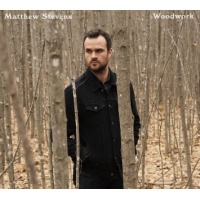 With Woodwork, Stevens' long-awaited debut, the guitarist steps forward and shows himself to be a master craftsman, an exceptional technician, and a startlingly original compositional force. This twelve-track program puts Stevens' multifaceted finger work upfront. Liquid thoughts, articulate lines, searing gestures, rapid-fire runs, and texture-rich sounds all come forth from his guitar at one time or another. One track might find him imparting peaceful and hazy thoughts that grow into something firmer ("Sunday"), another might find him engaged in the art of repetitive rhythmic riffing ("Gut Check"), and a third may put him in the heat of battle with pianist Gerald Clayton, with each man alternately firing off one fleet-fingered run after another ("Star L.A."). There is no single sound, stylistic marker, or direction here, as shifty and knotty thoughts can quickly be replaced by heartfelt sounds, and forceful gestures give way to sensitive searching. While Stevens occasionally plays with the ensemble size here, whittling things down to a trio for a pellucid acoustic guitar journey ("Brothers") and exploring the softer side of things in a duo with Clayton ("Gently"), the majority of the material is built around a first-rate quintet with a strong rhythmic presence. Stevens and Clayton prove to be the primary voices in the mix, but the contributions of bassist Vicente Archer, drummer Eric Doob, and percussionist Paulo Stagnaro shouldn't be overlooked. Archer's insistent lines push the band forward on the more aggressive material and he provides supportive cushioning on the more relaxed numbers; Doob's inventive grooves and serve-the-music attitude elevate these performances; and Stagnaro shatters the percussionist-as-minor-colorist stereotype with his performance, adding volumes, not trifles, to this music. Woodwork works on so many levels, as songs, sonic stories, and sound sculpting all beautifully come together under a single roof. Track Listing: Ashes (One); Star L.A.; Woodwork; Sequel; Blasted; Sunday; Gut Check; Brothers; Ashes (Two); Uptown Dance Party; Grown Up; Gently. Personnel: Matthew Stevens: guitar; Gerald Clayton: piano; Vicente Archer: bass; Eric Doob: drums; Paulo Stagnaro: percussion.